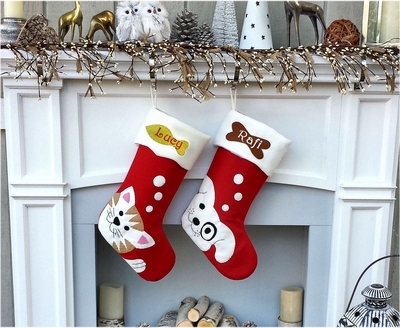 Cute Dog Whimsical Christmas Stockings Personalized Embroidered with your Puppy or Kitty's name. Cute Dog Bone or Cat Fish Applique on the cuff. Materials: The body of the stocking is wool cotton polyester blend, almost feels like cashmere and the inside is lined with satin lining. Measured along the diagonal from the top left hand corner to the toe, the stocking measures 17 inches, and the width along the cuff is 6.5 inches. This Stocking is not a huge stocking, but it is just a nice perfect size to display among your other stockings and enhance your decor, while giving Santa the ability to put some stocking stuffers for those special family members. Lining: This stocking is fully lined in satin. Gives the stocking nice finished high end look and feel. Each name is machine embroidered with the first letter in upper case and the remaining letters in lower case. As this stocking is skinnier than most, we have about 3.5" space on the cuff to fit the embroidery. So on these the embroidery lettering is small enough to fit over the doggie bone or the fishie on the cuff.